Retail sales rose in February, up by 0.4% on the previous month, official figures show. But sales at food stores saw the biggest fall since December 2016, the Office for National Statistics said. Separate data showed government borrowing fell to £0.2bn in February from £1.2bn a year earlier. After 11 months of the current financial year, government borrowing stands at £23.1bn, 44% lower than in the same period last year. Unusually warm weather in February contributed to the rise in retail sales, said the ONS, boosting spending at garden centres and on sporting equipment. 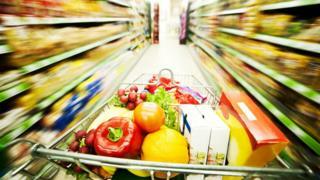 A decline of 1.2% in food stores was offset by growth in all other main sectors, it added. The ONS's head of retail sales, Rhian Murphy, said strong increases in fuel sales and online shopping had also driven the continued "bounce back". She added: "Food growth slowed, however, due to a significant fall for supermarkets, specialist food and alcohol stores in February after the sales and promotions seen in January came to an end." Annual retail sales growth in the year to February was 4%. The government borrowing figures, issued separately, are subject to revision. January's figure, which at the time showed a record surplus of £14.9bn, has now been revised down to £13.3bn. In his Spring Statement last week, Chancellor Philip Hammond cut the borrowing forecast for the 2018-19 financial year to £22.8bn, almost £3bn lower than the £25.5bn predicted by the Office for Budget Responsibility at the time of the October 2018 Budget. However, the January revision means that Mr Hammond "may just miss out" on his new lower forecast, according to analysis by the EY Item Club. The government needs to borrow the money to plug the gap between what it spends on public services and the tax revenues it collects. The OBR expects the improvement in the public finances to continue in future years, helped by stronger tax receipts and lower spending on debt interest. Mr Hammond warned that a disorderly Brexit would deal a "significant" blow to economic activity in the short term and pledged to spend £26.6bn to boost the economy if MPs voted to leave the EU with a deal. Public sector net debt at the end of February 2019 was £1,785.6bn or 82.8% of GDP. That was £22.7bn higher than in February 2018, but 1.4 percentage points lower as a proportion of GDP. Paul Dales, chief UK economist at Capital Economics, said: "With just eight days to go until Brexit and the uncertainty higher than ever, it is reassuring that in February households increased their spending at a decent rate. "And February's public finances data suggest that the chancellor has the cash to splash if there were a no-deal Brexit."